In news that is sure to inspire some action-packed disaster movies, scientists have determined that the time between explosive volcanic ‘super eruptions’ is actually much less than previously thought. But, while this sure sounds like another reason to like awake at night wallowing in existential dread, scientists say we shouldn’t freak out just yet. 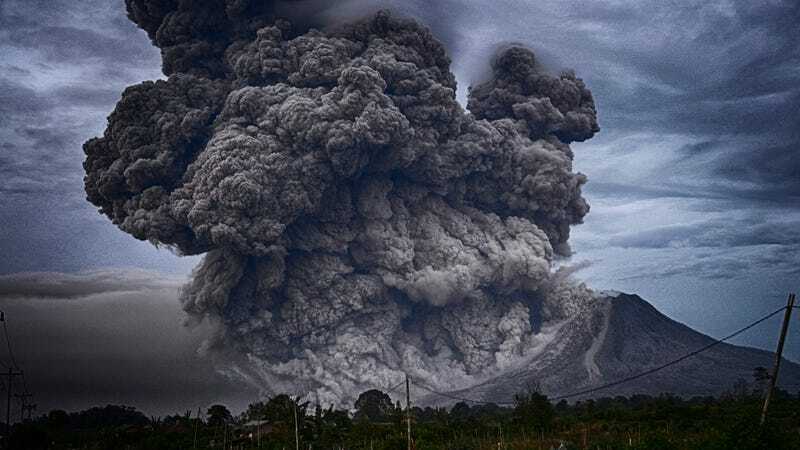 The University of Bristol-led analysis of geological records from the last 100,000 years found that the average time between super eruptions—which release more than 1,000 gigatons of material, or enough to cover a continent in ash—is around 17,000 years. That’s just a few thousands year longer than modern civilization has been around. The previous estimate, from 2004, determined that super eruptions occurred on average every 45,000 to 714,000 years. The new analysis, published Wednesday in the journal Earth and Planetary Science Letters, limits this range to 5,200 to 48,000 thousand years. Jonathan Rougier, a statistical science professor at the University of Bristol and author on the report, told Earther that by reanalyzing geological records and taking advantage of statistical techniques, his team found that large eruptions are less frequent than expected, while super eruptions are more frequent. Like nuclear war with North Korea or runaway climate change, to name a couple. Rougier said even with the new analysis, there is still no credible way to predict when the next super eruption will occur, but he cautioned not to worry too much about it. “I don’t think there is a need to freak out about an event which occurs roughly once every 17,000 years,” he said. The two most recent super eruptions were between 20 and 30 thousand years ago, according to the study. Some volcanoes, like the famous one under Yellowstone, have had more than one super eruption. If a super eruption were to occur, the mass of sulfur dioxide propelled into the atmosphere would cloak the planet in dust and cut off sunlight. Earth would cool, crops would wither and die, people would go hungry, and civilization could potentially enter free fall. Stephen Sparks, an Earth science professor at the University of Bristol and author on the study, told Earther that impact caused by the sulfuric acid—which would remain suspended in the atmosphere as tiny droplets for some time—would result in major cooling of the climate for at least several years that would also alter rainfall and drought patterns. “Since many species are already fragile and on the verge of extinction it seems likely that there would be species loss,” he said. Sparks said that while they don’t know precisely which volcanoes have the potential for the next super eruption, there are volcanoes in the U.S., Chile, New Zealand, Indonesia, and Turkey that have a track record devastating blasts in the past. As for the future, there’s no need to take cover yet. But maybe watch a few natural disaster movies just to imagine what it’d be like in the off chance something unexpected happens.